Hey there lovelies!! I am sure most of you know that the lovely Alexa over at Alexa Loves Books is hosting her annual Love-A-Thon, it is just another way that some of us are trying to focus on the cheer and positive aspects of our book blogging community. I will have a few posts on the blog throughout the weekend, and will be participating as much as I can on Twitter using the hashtag #LoveAThon so make sure to stay tuned! Happy reading, friends!! Alyssa, but honestly so few people call me that as I have so many nicknames from my loved ones. I go by “A” in the blogging world mostly. New England – I WAS PROMISED SNOW, WHERE IS IT?! I was actually in graduate school for my MLIS a few years back and we had to observe different resources for reader’s advisory, one of which being blogs. I had been following a few (The Book Smugglers, and Broke & the Bookish being two!) and I thought about how fun it would be so I started one, and convinced my friend Heidi from Bunbury in the Stacks that it was a good idea that she start one as well! I wanted something that was meaningful to me, that spoke of my feelings regarding books and how important they are. I have always felt that books took me away from the drama of the real world and you can become immersed in the fictional world for a little while and forget whatever it is that needs forgetting. 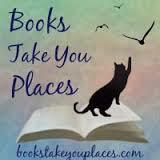 Thus Books Take You Places was born. I read a lot of fantasy, it makes me the happiest! Hmm I have been known to write some Disney posts ranking the swooniest male leads and villains. I also write some “non-traditional” reviews for my On the Same Page feature that I do with Amy (Tripping Over Books) and Brittany (The Book Addict’s Guide)! Hands down, the best blogging experience has been meeting my best friends. I like to call Amy and Brittany my “better thirds” because they make me a better person overall. I often think about how lucky I am to have found soul friends through the power of THE INTERNET 😀 Honestly, I couldn’t make it through a day without these two. With these two, I have created The Secret Sister Project which does its own to foster positivity in the community, that is probably the blogging experience of which I am most proud. THE community is my favorite thing about the community!! Though we have those negative moments, for the most part everyone works hard to promote positivity and importantly, LITERACY. As a librarian I am a huge advocate for ALL THE READING!! It honestly brings me glee that I can hop on an app on my phone, send out a message or inquiry or even sad thought and have so many people reply back with an array of assistance. I have to finish Winter…oops. What’s an underrated book or series that you think everyone should read? The Caged Graves by Dianne Salerni. I loved it so much. It encompasses so many wonderful elements. If you’re looking for an immensely atmospheric, mysterious, and romantic read, I highly recommend that you pick this one up immediately. Hmm I binge watch a lot of shows (currently the last two seasons of Downton Abbey), I spend hours and days playing video games, and then don’t play again for ages (currently The Witcher), I do puzzles and just started loom knitting like a proper old lady. When it’s warm, I hike and Letterbox and sometimes Geocache…but for the most part, I read. Hmm…makeup, I suppose. I don’t really shop for myself, though I spend a lot of time buying fun presents for other people! Oh lawd…I don’t know! This depends on who I am with, you know? Whitney Houston’s “I Will Always Love You” is a song that I will sing no matter where I am when it comes on, can we count that? I think….The Night Circus by Erin Morgenstern. Of course, this is only if it can be made PHENOMENAL. Like, Harry Potter adaptation phenomenal. Actually it would look like my personal library…I work very hard to make it the coziest place ever! Definitely Neil Gaiman! This is the obvious choice, right? It isn’t just because of my obvious obsession with his works, I think that he is incredibly brilliant. I would love to talk to him about all things in life, and I think we would have enlightening conversations! After I got over my definite nervousness, of course! This entry was posted in Book Blogger Love-a-Thon and tagged blog feature, blogger, blogger feature, bloggers, books, event, feature, features. Bookmark the permalink. I would be VERY interested in an excellent “Night Circus” movie! I would love to see a Night Circus film!! Also, I love Neil Gaiman so much. I managed to embarrass myself so much the first time I met him because I was just so starstruck. He literally interrupted me midsentence and asked if he could give me a hug. Then I was speechless which I’m sure he appreciated!!!! Alyssa! I love seeing people’s excitement for the Secret Sister project you created with Amy and Brittany! It’s bringing so much joy to the community.